The Burnout series helped define a generation of arcade-style racing games, and essentially pioneered the action racing sub-genre alongside it. The early ’00s were a time of great transition within the industry, and Criterion was ahead of the curve when it came to racing games. Their Burnout series began on the PS2 and was a modest success, while the second installment blew the doors off the genre. They gained so much traction that EA bought the company and released Burnout 3: Takedown, which remains the high-point in action-racers to many to this day. 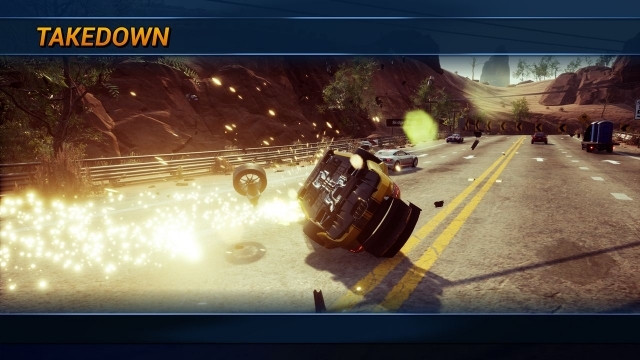 Burnout Revenge furthered the action by not only allowing you to knock enemies off the track for a signature takedown, but check other cars into one another. The open-world Paradise was the last true entry, and the last true action-centric racer console players have had since 2008. 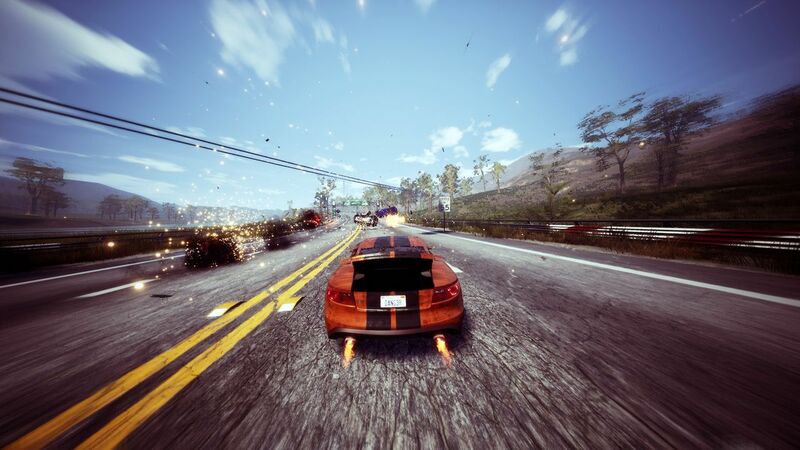 Three Fields Entertainment (TFE) was formed by many of the original Burnout team and set out to rebuild their legendary series bit by bit. Danger Zone brought back a crash test version of the beloved Crash mode, while its sequel did the same in more traditional real-world settings. Now, fans waiting for a return to form with action racing can rejoice as Dangerous Driving brings back the fast pace and frantic action their former series was known for. 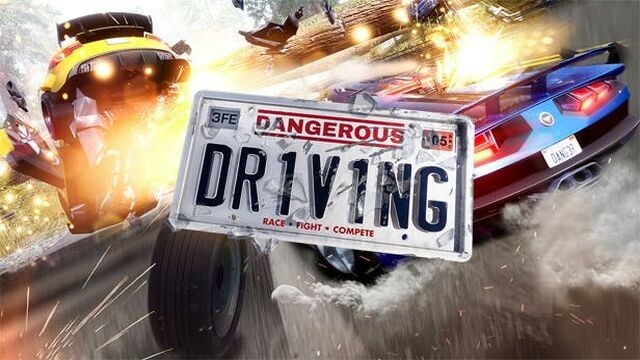 There are some definite caveats in terms of the sheer quantity of what’s offered up, but in terms of quality, Dangerous Driving is on-par with the best of Burnout Revenge and tops that high-point for that series at times. The overall structure of the game is very similar, only with a menu layout more akin to Burnout 2 than the sea of sub-menus seen in the fourth entry. 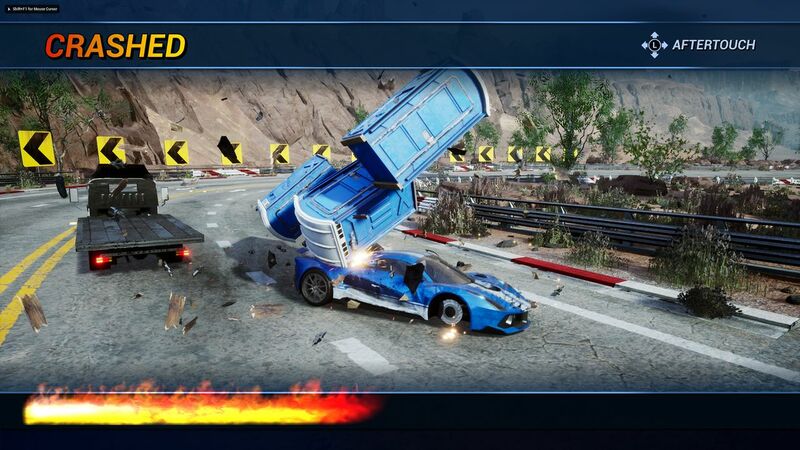 Fans of the pre-Paradise Burnout will be right at home as this has not only normal races, but lap-based time trials, takedown-centric events where the most (or best kinds of) takedowns that send rivals off-track allow you to win, GP events, and a variety of vehicle types alongside a new mode. Heatwave is all-new and adds a great sense of risk to the goings-on. While in every other mode you can boost as much as you want (basically until you crash or run out), in this one, you can’t. You can only boost after filling up the boost gauge fully – which means racing against traffic, avoiding crashes, or causing some yourself. Not only can you only boost with a full meter, but you need to chain your boosts together in order to survive. It’s a tough mode, but an incredibly fun one and the greatest test of skill TFE has ever put together in an arcade racer. Survival mode is easily one of the best blends of challenge and pure fun in the game. Your goal is to last as long as possible without crashing, while still dealing with not only traffic flowing in your direction, but against you. It’s a mode that forces you to retrain your brain because you’re so used to driving offensively, and yet it all clicks together perfectly. Lasting longer than expected wasn’t just a thrill, but it led me to discovering a rarely-seen Platinum medal that goes far beyond the expectations for a gold medal. You don’t really earn anything in-game for it in terms of unlockables, but it is thrilling to go to 11 on the accomplishment scale here – and it’s something you can do in score-centric modes. There are some small issues with Dangerous Driving as a whole. The lack of any kind of mini-map means that it’s hard to see when one lap is going to end. You can either memorize the starting point and use that as a point of reference or use your lap times as a rough estimate of knowing about how much time you have to either recover from falling behind or have to keep at the front of the pack. Beyond that, there’s a bit of jank to things – whether it’s scoring a takedown and somehow being behind the pack or awkward cuts from a takedown that make it hard to get your bearings right away. Others may take issue with cars being left as mangled heaps on the ground after a takedown in more traditional race events. While it does act as an incentive to not race too aggressively, it also makes you think about taking someone out versus simply avoiding them. Visually, the game benefits from a very clean look overall. 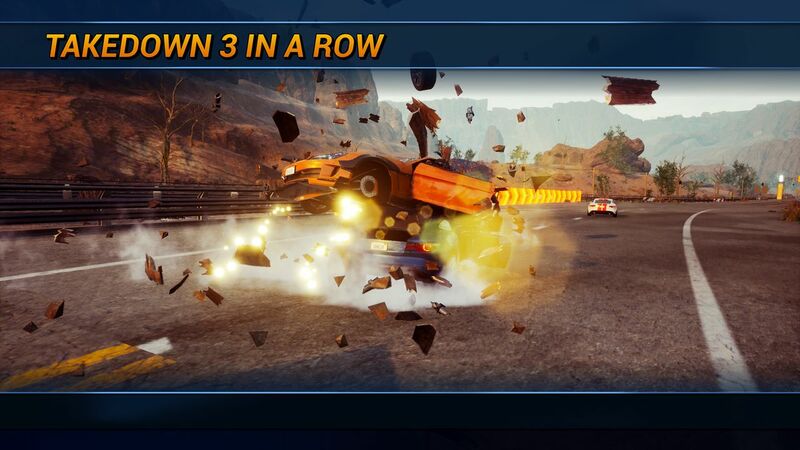 The menus, car presentation, and unlock setup are nearly identical to early Burnout games – so it feels very familiar. 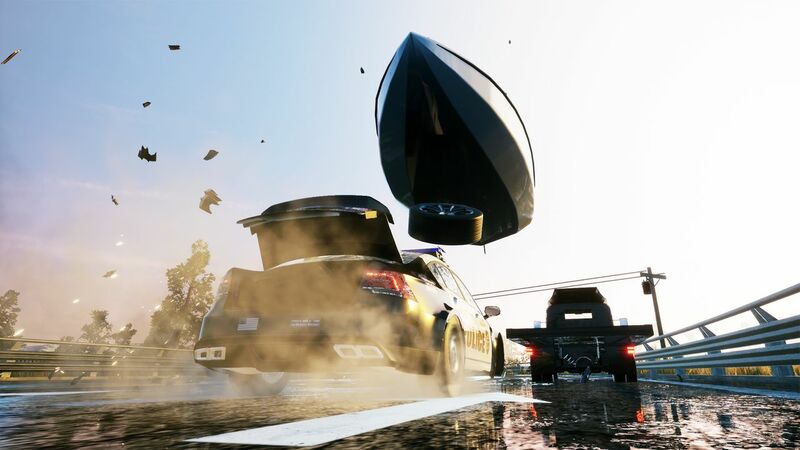 As a whole, TFE definitely put a lot of work into the crashes, the car models and their damage levels. Tracks themselves usually look great, although some do have some odd texture warping when you’re just starting out that makes everything appear smeared on top of the asphalt. This isn’t an issue in every area, as some do feature road textures with depth to them, but it’s definitely something that sticks out a bit when you notice it. Crashes themselves are visceral and work in concert with the violent sound effects to create a chorus of vehicular chaos for the eyes and ears. The Burnout series became known for incorporating a lot of licensed music – with a high mix of good towards the start of EA’s involvement before devolving into terrible with things like Avril Lavigne’s “Girlfriend” being used in multiple languages – because English wasn’t bad enough. Three Fields doesn’t have the same resources, so getting licensed music wasn’t doable – but they did ink a deal with Spotify to allow people to play custom licensed playlists within the game as the in-game soundtrack. It’s a brilliant workaround and about on par with the original Xbox playing music off the hard drive in terms of sound mixing making it all sound like it was intended for the game. Unfortunately without a Spotify premium account, you’re left with no in-game music during a race despite there being music for the menus – so that’s a definite drawback. 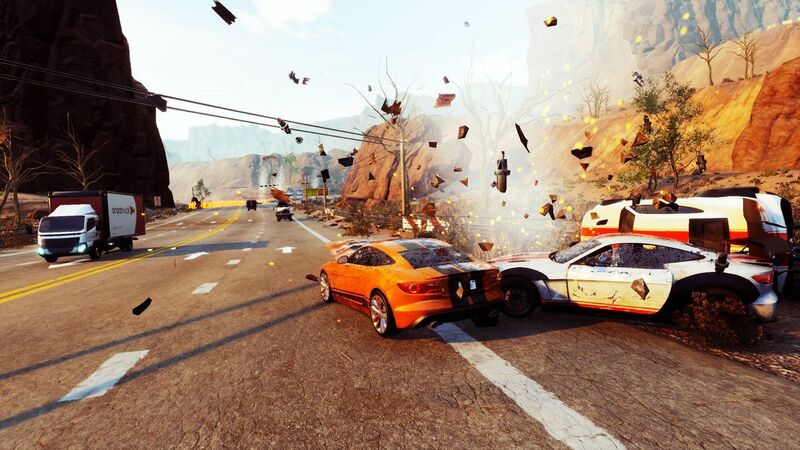 Overall, Dangerous Driving does a fantastic job of offering up a modern-looking take on the Burnout franchise. There are some definite concessions with Three Fields Entertainment not being as large as Criterion was, but the good thing is that the high-quality content the team was known for there has been carried over here. There are more modes available spread out over a smaller area, and the way the menus are structured makes it seems like there’s less content than there is, but the plethora of unlockable vehicle classes, event types, and vehicles makes the upward climb in the rankings feel rewarding from beginning to end. 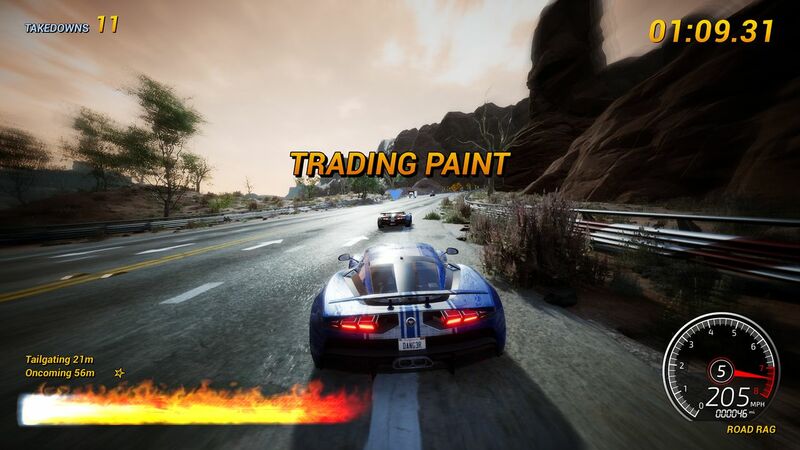 It’s a must-buy for anyone who has craved a new Burnout game and physical buyers of the console version get Danger Zone 2 as a freebie – essentially bringing back Crash mode and providing more value for the money. 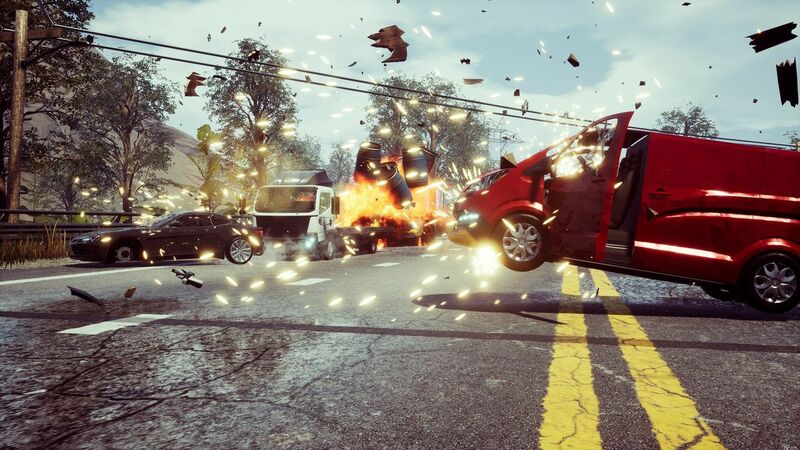 This review is based on a digital copy of Dangerous Driving for the Xbox One provided by Three Fields Entertainment.